Porthole Cruise Magazine readers chose Un-Cruise Adventures as best expedition cruise line in the magazine’s 16th annual Readers’ Choice Awards in 2014. The small ship adventure cruise line explores remote and scenic destinations with an emphasis on flexible itineraries, wildlife viewing and active pursuits outdoors. Porthole Cruise Magazine’s Reader’s Choice Awards are determined by thousands of readers and online fans of Porthole Cruise Magazine who voted for their favorite cruise lines and ships in 54 cruise-related categories. 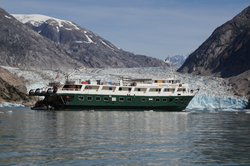 In business since 1996, the company has expanded from operating yachts in Alaska to operating a fleet of eight vessels carrying 22-88 guests. Boutique yachts, expedition vessels and small ships sail adventure and river cruises in Alaska, Hawaiian Islands, Mexico’s Sea of Cortés, coastal Washington, British Columbia and Columbia and Snake Rivers. In 2016, eight departures will be offered in the Galápagos Islands and adventure cruising begins in Costa Rica and Panama. Adventure activities guided by expert naturalists are included on all adventure cruises and may include kayaking, snorkeling, paddle boarding, skiff excursions, whale watching, polar plunge, hiking, beachcombing and cultural encounters. Flexible itineraries allow time to seek out and view wildlife up close, explore deeper into wilderness areas and take advantage of current weather and wildlife. On river cruises, guided tours to points of historical interest are included each day along with crew in period uniform and onboard living history presentations. See the full list of Porthole Cruise Magazine award winners online. Winners will be published in the November/December 2014 issue of the magazine. To book an Un-Cruise adventure or to request additional information, contact your travel agent or Un-Cruise Adventures at 888-862-8881 or sales(at)un-cruise(dot)com.